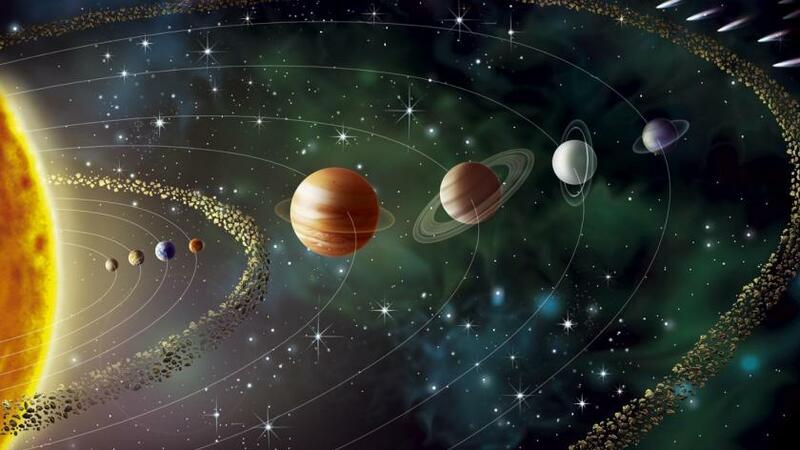 Bhagavata Purana, composed around 1800 BCE describes in detail, Stars, planets in our solar system, Sun, their dimensions, distances between them, climatic and karmic effects of their movement. sa eṣa bhagavān ādi-puruṣa eva sākṣān nārāyaṇo lokānāṁ svastaya ātmānaṁ trayīmayaṁ karma-viśuddhi-nimittaṁ kavibhir api ca vedena vijijñāsyamāno dvādaśadhā vibhajya ṣaṭsu vasantādiṣv ṛtuṣu yathopa-joṣam ṛtu-guṇān vidadhāti. Translation : Original cause of the cosmic manifestation is the Supreme Personality of Godhead, Nārāyaṇa. When great saintly persons, fully aware of the Vedic knowledge, offered prayers to the Supreme Person, He descended to this material world in the form of the sun to benefit all the planets and purify fruitive activities. He divided Himself into twelve parts and created seasonal forms, beginning with spring. In this way He created the seasonal qualities, such as heat, cold and so on. Srimad Bhagavatam, Canto 5, Chapter 22 describes our solar system in detail. yathā kulāla-cakreṇa bhramatā saha bhramatāṁ tad-āśrayāṇāṁ pipīlikādīnāṁ gatir anyaiva pradeśāntareṣv apy upalabhyamānatvād evaṁ nakṣatra-rāśibhir upalakṣitena kāla-cakreṇa dhruvaṁ meruṁ ca pradakṣiṇena paridhāvatā saha paridhāvamānānāṁ tad-āśrayāṇāṁ sūryādīnāṁ grahāṇāṁ gatir anyaiva nakṣatrāntare rāśy-antare copalabhyamānatvāt. Translation : Śrī Śukadeva Gosvāmī clearly answered: When a potter’s wheel is moving and small ants located on that big wheel are moving with it, one can see that their motion is different from that of the wheel because they appear sometimes on one part of the wheel and sometimes on another. Similarly, the signs and constellations, with Sumeru and Dhruvaloka on their right, move with the wheel of time, and the antlike sun and other planets move with them. The sun and planets, however, are seen in different signs and constellations at different times. This indicates that their motion is different from that of the zodiac and the wheel of time itself. The time that the passage of the sun takes moving through both the spheres above and below, speeding slow, fast or moderate, is in the descriptions of the scholars discussed as a samvatsara [a solar year], a parivatsara [one twelfth of a revolution of Jupiter], an idâvatsara [a day of the gods consisting of 360 solar days] an anuvatsara [a lunar year comprising twelve lunations] and a vatsara [a year to the ecliptic in terms of the 27 lunar mansions or nakshatras. evaṁ candramā arka-gabhastibhya upariṣṭāl lakṣa-yojanata upalabhyamāno ’rkasya saṁvatsara-bhuktiṁ pakṣābhyāṁ māsa-bhuktiṁ sapādarkṣābhyāṁ dinenaiva pakṣa-bhuktim agracārī drutatara-gamano bhuṅkte. Translation : Sun lit Moon, who is placed a hundred thousand yojanas [astronomy: ± 385.000 km] above [the earth] and is moving much faster [than the sun], is so the passage of one year of the sun covered by the passage of two fortnights, is in two and a quarter of a day one solar month [or one twelfth of the sky] passed and is in only one day [the portion of] a fortnight of solar days passed. tata upariṣṭād dvi-lakṣa-yojanato nakṣatrāṇi meruṁ dakṣiṇenaiva kālāyana īśvara-yojitāni sahābhijitāṣṭā-viṁśatiḥ. Translation : [More than] two hundred thousand yojanas behind [the moon], leaving Meru to the right are there, together with the many stars by the Controller attached to the wheel of time, the twenty-eight stars headed by Abhijit (Vega). tata upariṣṭād uśanā dvi-lakṣa-yojanata upalabhyate purataḥ paścāt sahaiva vārkasya śaighrya-māndya-sāmyābhir gatibhir arkavac carati lokānāṁ nityadānukūla eva prāyeṇa varṣayaṁś cāreṇānumīyate sa vṛṣṭi-viṣṭambha-grahopaśamanaḥ. Translation : At a distance of two hundred thousand yojanas there about [about the star center or the sun; astronomy: at a distance of 107 million km] there is Us’anâ [Venus], the planet that can be seen going in front, behind and rotating along with the sun just as fast, slow or with a moderate speed. It is of all the planets the one considered to exert as good as always a favorable influence in the form of rainfall, it by its movements neutralizes the influence of planets that obstruct rainfall. uśanasā budho vyākhyātas tata upariṣṭād dvi-lakṣa-yojanato budhaḥ soma-suta upalabhyamānaḥ prāyeṇa śubha-kṛd yadārkād vyatiricyeta tadātivātābhra-prāyānāvṛṣṭy-ādi-bhayam āśaṁsate. Translation : Another two hundred thousand yoyana’s behind Venus [astronomy: 57.9 million miles from the sun], so is explained, is there situated Mercury, the son of the moon; he is as good as always working auspiciously, but at the time he stands apart from the sun is there almost always an increase of fearful conditions like draughts, a closed sky, and stormy conditions. ata ūrdhvam aṅgārako ’pi yojana-lakṣa-dvitaya upalabhyamānas tribhis tribhiḥ pakṣair ekaikaśo rāśīn dvādaśānubhuṅkte yadi na vakreṇābhivartate prāyeṇāśubha-graho ’gha-śaṁsaḥ. Translation : Two hundred thousands yojanas outside of our orbit there is also Mars [astronomy: at about 228 million km from the sun]; in three by three fortnights does he, if he doesn’t make a curve, one after another pass through the twelve signs and in his approach he is as good as always an unfavorable planet giving trouble. tata upariṣṭād dvi-lakṣa-yojanāntara-gatā bhagavān bṛhaspatir ekaikasmin rāśau parivatsaraṁ parivatsaraṁ carati yadi na vakraḥ syāt prāyeṇānukūlo brāhmaṇa-kulasya. Translation : Two hundred thousand yojanas outside of Mars [astronomy: 778.3 million km from the sun] is there the most powerful planet Jupiter who, if he doesn’t run a curve, takes a year [parivatsara] to one after another move through one sign; to the brahmins in the universe he almost always turns out to be very favorable. tata upariṣṭād yojana-lakṣa-dvayāt pratīyamānaḥ śanaiścara ekaikasmin rāśau triṁśan māsān vilambamānaḥ sarvān evānuparyeti tāvadbhir anuvatsaraiḥ prāyeṇa hi sarveṣām aśāntikaraḥ. Translation : Two hundred thousand yojanas behind him is situated Saturn [astronomy: 1.43 billion km from the sun], who takes a period of thirty months to travel through each single sign and for sure is as slow as taking an equal number of years [anuvatsara’s] to pass through all of them; he indeed means almost always a lot of trouble to all. tata uttarasmād ṛṣaya ekādaśa-lakṣa-yojanāntara upalabhyante ya eva lokānāṁ śam anubhāvayanto bhagavato viṣṇor yat paramaṁ padaṁ pradakṣiṇaṁ prakramanti.